The explosive death of a star seeded matter into the solar system soon after its birth, analysis of a meteorite now reveals. Earth and the rest of the solar system coalesced from a giant cloud of gas and dust more than 4.5 billion years ago. Many of the details about the galactic neighborhood in which the solar system arose still remain a mystery. Meteorites contain some of the oldest material in the solar system, dating back to its formation. As such, researchers often analyze these objects in order to discover what materials were present when the sun, Earth and other planets were born. This study sheds light on where these solar system bodies might have come from. "This is evidence for supernova addition at the very start of our solar system, over 4.5 billion years ago," said the meteorite study's lead author,Gregory Brennecka, a cosmochemist at Lawrence Livermore National Laboratory. Brennecka and his colleagues investigated the Allende meteorite, which fell to Earth as a fireball in Mexico in 1969. Theyfocused on lumps within this meteorite known as calcium-aluminum-rich inclusions. These particles are some of the oldest objects in the solar system — they were the first solids to form in the protoplanetary disk that eventually gave rise to Earth and the other planets. Brennecka and his colleagues discovered these inclusions all had similar concentrations of isotopes. However, the concentrations were distinct from the average composition of the materials that make up the bulk of meteorites and the Earth. The researchers propose the inclusions formed close to the young sun, possibly within a span as short as 20,000 to 50,000 years. As such, matter from a nearby supernova did not pollute these inclusions, as it did the outer regions of the protoplanetary disk. The inclusions later mixed with the material that went on to make the Allende meteorite and other rocks. 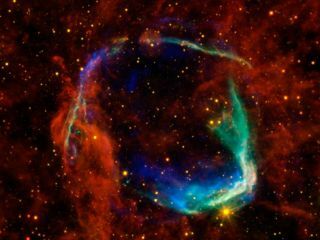 "Not only do we know that the supernova happened, we can see what material was injected and how it changed the elemental and isotopic composition of our solar system," Brennecka told SPACE.com. These findings are consistent with the notion that the solar system developed in an active star-forming region of the galaxy. Stellar nurseries are often home to stars that go supernova. Future research can aim to better understand the fingerprints of this supernova in other samples "and how much influence it and possible other supernovae had on the development of our solar system," Brennecka said. Brennecka and his colleagues Lars Borg and Meenakshi Wadhwa detailed their findings online Oct. 7 in the journal Proceedings of the National Academy of Sciences.